At Northwestern’s Auditory Neuroscience Lab, Kraus and colleagues measure how the brain responds when various sounds enter the ear. They’ve found that the brain reacts to sound in microseconds, and that brain waves closely resemble the sound waves. Making sense of sound is one of the most “computationally complex” functions of the brain, Kraus said, which explains why so many language and other disorders, including autism, reveal themselves in the way the brain processes sound. The way the brain responds to the “ingredients” of sound—pitching, timing and timbre—is a window into brain health and learning ability. Kraus has learned that the brain’s response to sound in children as young as three is predictive of their ability to read. Her lab can also identify those children who are likely to struggle to read before those kids show signs of the language disorder. This kind of forecasting, Kraus said, could help schools and parents direct resources where they’re needed most. The brain changes in response to the sounds it’s processing; a three-year-old’s brain can adapt if the sound environment is altered. Reduce noise. 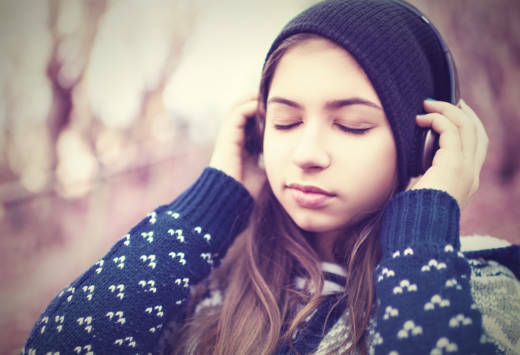 Chronic background noise is associated with several auditory and learning problems: it contributes to “neural noise,” wherein brain neurons fire spontaneously in the absence of sound; it reduces the brain’s sensitivity to sound; and it slows auditory growth. A study of two different third grade classrooms--one overlooking a highway and the other beside a quiet field--found substantially better learning outcomes for kids in the quieter room. Because income and noise exposure are correlated—the lower the income, often, the louder the environment—finding pockets of quiet are that much more important for disadvantaged children. In school, this means building a quiet classroom, with acoustics in mind. Read aloud. Even before kids are able to read themselves, hearing stories told by others develops vocabulary and builds working memory; to understand how a story unfolds, listeners, need to remember what was said before. For children growing up in poverty, exposure to the spoken word is especially valuable, as studies suggest that these children tend to hear up to 30 million fewer words by the age of five. There’s no reason to stop reading stories aloud once kids can read for themselves. “Being read to is wonderful,” Kraus said, especially if the bulk of one’s day is spent hunched over a laptop or buried in a book. Hearing well-told stories can take a student away from her routine dilemmas and deliver her to a different world. Encourage children to play a musical instrument. “There is an explicit link between making music and strengthening language skills, so that keeping music education at the center of curricula can pay big dividends for children's cognitive, emotional, and educational health,” Kraus said. Two years of music instruction in elementary and even secondary school can trigger biological changes in how the brain processes sound, which in turn affects language development. Listen to audiobooks and podcasts. Well-told stories can draw kids in and build attention skills and working memory. The number and quality of these recordings has exploded in recent years, making it that much easier to find a good fit for individuals and classes. “There’s a tremendous amount of didactic information in audio format,” Kraus said. Teachers can include listening exercises as part of their curriculum. In Kraus’s course on the biological foundations of speech and music, for example, she assigns a podcast from the WNYC program “RadioLab” The Walls of Jericho, to help students better understand decibels. Support learning a second language. Growing up in a bilingual environment causes a child’s brain to manage two languages at once. The challenge required to make sense of two different languages bolsters the connection between auditory and neural processes, strengthening the brain’s ability to focus. Second-language learning is also associated with improvements in executive function. Use the spread of technology to your advantage. Rather than bemoan the constant bleeping and chirping of everyday life, much of it the result of technological advances, welcome the new sound opportunities these developments provide. Technologies that shrink the globalized world enable second-language learning. Online videos allow aspiring musicians to listen and learn from others who are playing the same piece. The ease of travel invites opportunities to hear other types of sounds that might not be typical in a local environment. Assistive listening devices can help offset hearing loss and language disorders. Judicious use of technological progress can be used to build effective sound-to-meaning connections. And noise-cancelling headphones or simple earplugs can be deployed as needed to shut down the unwanted sounds that some technologies emit.